Kwartellaan 19 Price asked € 2.750 p.m. ex. On perfect location, in safe and popular “Vogelwijk” area, a very charming seven room family corner “country house” with five bedrooms, modern bathroom and kitchen, garden on three sides and garage. 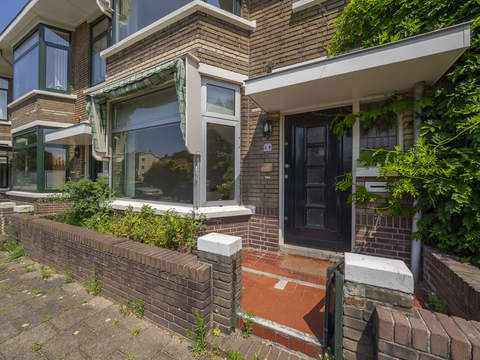 On walking distance from dunes and sea and near the new International School of the Hague. Entrance through front garden, hall with storage under the stairs, toilet with hand basin, modern kitchen (2013) with on both sides worktop, new built in equipment and scullery. Cozy and spacious living-/ dining approx. 6.20 x 3.90 and 4.30 x 2.60 with authentic separation leaded glass and laminate floors. Through kitchen to spacious backyard (total area garden approx. 240 m²) facing on the northeast. Landing with built-in closet, bedroom app. 2.40 x 2.10, sunny bedroom approx. 3.60 x 3.85, master bedroom (back) approx. 4.60 x 3.35 with entrance to modern bathroom (2013) approx. 2.55 x 2.60 with bath, separate shower, toilet, washbasin and entrance to balcony approx. 3.00 x 1.00. Small landing, bedroom at the front approx. 3.45 x 3.35 with storage and bedroom at the back approx. 4.60 x 2.80 with washing machine, dryer and central heating system. The rent is exclusive gas/electricity/water. Annual maintenance central heating system and sweeping chimney paid by tenant. Garden on three sides, approx. 240 m² located on the northeast with detached garage. The maintenance situation inside and outside is good to excellent. Living area approx. 150 m². The contents of the house is approximately 420 m³. At walking distance of beach, dunes and sea, public transport bus 24 and tram 12, shops at Goudsbloemlaan and Fahrenheitstraat, Bosjes van Pex with also sport facilities such as tennis, soccer, hockey and horse back riding. Near to various schools, International School of The Hague and roads through Westland Road. Living surface approx. 150 m². The volume of the house is approx. 420 m³.